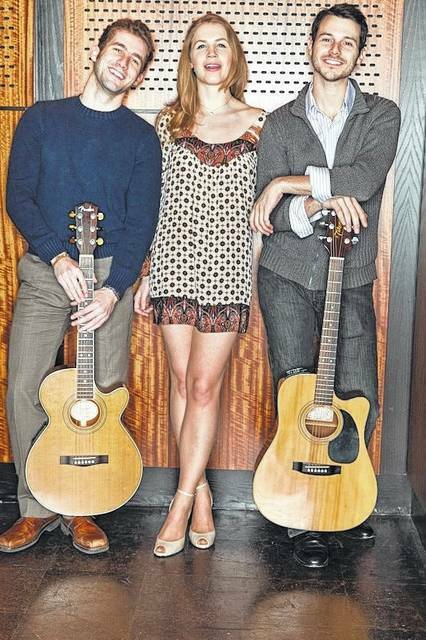 BUCYRUS — A Band Called Honalee, a modern-day folk trio inspired by the legacy of Peter, Paul & Mary, makes a much-anticipated appearance at the Crawford County Community Concert Association’s Thursday, April 20, 2017, show. Musically accomplished, interactive and energetic, A Band Called Honalee draws inspiration from The Mamas & Papas, Simon & Garfunkel, The Beatles, Bob Dylan, The Byrds and other legends of 1960s folk-rock. By reinvigorating their iconic songs with fresh harmonies, A Band Called Honalee brings this vital American music back to life once more. Following in the footsteps of Peter, Paul & Mary, A Band Called Honalee got its start in the heart of New Year City’s East Village in 2009. Since then, they have pursued an active touring schedule around the country. Their self-titled debut CD was released in the spring of 2015. Great seats are still available for this exciting show at 7 p.m. on April 20 at the Bucyrus Elementary School Auditorium, 245 Woodlawn Ave., Bucyrus. Doors open at 6:30 p.m.
For additional information on this show and ticket information, go to the “Membership/Tickets” tab on Concert Association website at: www.crawcocommconcert.com and key on the iTickets.com link or by calling 800 965-9324. “Student Special” -Half price tickets for this show for children 18 years old or younger are also available.